Your tire pressure monitoring system, often referred to as TPMS, is an electronic system designed to monitor the air pressure in your tires. This system uses real time tire pressure information to alert you if there is a tire pressure problem. If your tire pressure drops to an unsafe level, it will alert you via a light or warning message. Many systems will also tell you which tire is low. Low tire pressure is not only a safety issue, but it will also drastically shorten the life of a tire. Tire pressure sensors are powered by a non serviceable battery and will eventually fail due to low battery voltage. The average lifespan of a tire pressure sensor is 7 to 9 years. It's also recommended that sensors be replaced or properly serviced when new tires are installed. 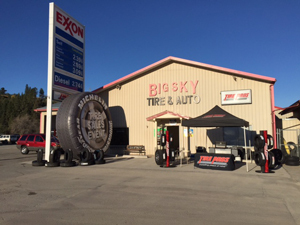 At Big Sky Tire Pros we have the tools, equipment, training and knowledge to properly service or diagnose your Tire Pressure Monitoring System. We would be happy to handle all of your tire service needs today.